Written by sylvia borgo on Monday, August 31st, 2015 at 6:00am. 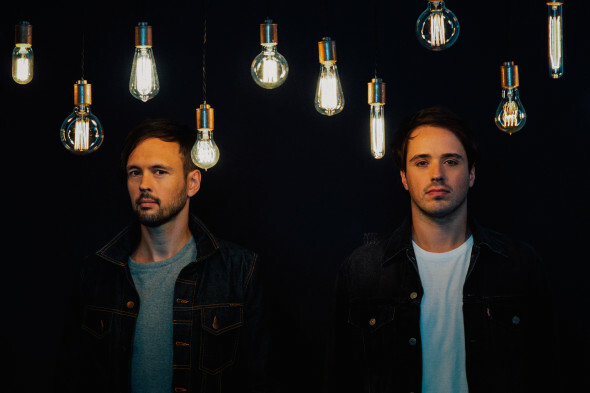 Owl and Bear contributor Sylvia Borgo recently spoke with Keith Jeffery, lead singer of Australian duo Atlas Genius. The band will play House of Blues San Diego on September 2 in support of their new album, Inanimate Objects. I know you were in Minneapolis at the Cultivate Fest just a few days ago and you’ll be in California by the end of the week. So, where are you now? I’m actually in Los Angeles right now. Been here for a couple of days and then we head up to San Francisco over the weekend for the beginning of the tour. And how is Los Angeles right now? L.A. is pretty typical with its weather. We are roasting here in the valley. A lot of cars going around plugging up the L.A. roads. What can you expect? So you’ll be in San Francisco to start your tour, then crossing the U.S. and heading up to Canada before coming back to California. You must really like being on the road—or you must really like California, which one is it? The answer is both. We actually live in Los Angeles, which is why we are here at the moment. We get as much joy from touring as from being in the studio. We took a long time off to do this new album and after it, we were both really missing being on the road. Apart from playing shows, what do you do when you’re on the road? It can be a grueling pastime being on the road, going from city to city, but the upside is that you get to see some pretty amazing cities. The best thing for us is when we get a day off. We had a few days off in Vancouver a couple of days ago. It must have been our fifth trip there, but it was only the first time that we had a moment to see how beautiful the city is. Sometimes a city can just be a green room and a stage and that’s pretty much all you get to see, but if you get the time off, you get to see some amazing cities. Vancouver was stunning. We hired bikes and rode around the Seawall in Stanley Park. I didn’t really know it existed until this trip. Tell me a little bit about your latest full-length, Inanimate Objects. It just came out on August 28. What was the process for writing and recording the album? It was a long process, a little bit stop and go for a while. Some of the initial writing happened in Australia at the beginning of last year and then it filled out after a couple of months. We uprooted everything and moved to LA. It really took a bunch of months for us to find the rhythm again: the rhythm of working, where we wanted to do it, who we wanted to do this album with. Unlike the first album, we decided to co-produce this album. It’s like getting married. You want to choose this person carefully. You don’t want to be spending six months or more in a studio with someone you don’t get on with. Even though there are many great people, awesome producers and writers and friends that we jammed with, it was finding the right guy that we wanted to spend that time with and go in together with. Eventually we did. Once it happened, things sped up again for us. Who did you end up choosing and what sorts of talents and special skills were you looking for? We ended up producing the album with Frederik Thaae, a Danish guy who had also just recently moved to L.A. He comes from an R&B and pop world, which was kind of nice. It was good to get someone who wasn’t so deep into the indie rock world because it helps to diversify things. It wasn’t even by design, we just got on as people. Coming from the pop world there were sensibilities that were interesting. On this specific album, how did the songs come about? How do you approach song writing? Well it is a craft you need to approach every day. It isn’t like building a brick wall where you arrive to a pile of bricks and you lay one on top of the other. It is one of those things where you build a wall and you rip it back down and do it twenty more times before it feels right. I’m sure you’ve heard about getting into a zone: when you’re there it seems effortless. The real effort is getting yourself to that point where lyrically and musically it all comes out. It is not a tap you can turn on or off. You’ve got to be there. You might write two songs in a day and it might be another month before you write another one. That’s just the way it goes. A lot of these songs are autobiographical to a certain extent. What I find is that when you are writing songs from your day-to-day experiences, you can really get lost in that emotion which helps you get out those words. You said you just moved out to Los Angeles. Why did you leave Australia? It’s not that we don’t love Australia, it s a beautiful place to live, a very easy place to live. I think there is such a strong community in Los Angeles these days. I feel like in the last few years especially, musicians have moved out from the East Coast as well. Most of our friends, if they are musicians, are not moving to the east, they are moving to the west. There is a little bit more space to have your own studio. Being able to make noise is a bit more viable here in Los Angeles. If you had a flat in Manhattan, you can’t make noise. Just the other day I was reminded about living in close quarters when we were in Vancouver and I was doing some writing and singing in the hotel room. Within ten minutes the hotel security came in and shut me down. That’s the same kind of thing if you had a little apartment in a building, that’s the same situation. You really wouldn’t be able to write and perform. What are the major differences between your American fans and your Australian fans. For example, what is typical fan behavior at concerts? You know what I think the nice thing about playing to American crowds is? They are a little bit less inhibited so you will get very passionate, vocal crowds here. We noticed it right off the bat when we came here. The crows are really loud. The crowds in Australia can be a bit of a tough audience. They might not give you back as much energy as American audiences. I think American crowds are great. Let me end this interview with a fun question. I’m very curious to hear about which artists you are listening to right now. Awolnation are a band I have a lot of respect for. They are unique and amazing live. One of the best live bands around. I’ve been listening to D’Angelo, I’m digging the album he put out recently. Phantogram is another band that I really like. I think that is a nice cross section of what I’m listening to right now.